Sounds easy, right? Nordby sifted through all the findings of rune codes in northern Europe, mainly Scandinavia and the British Isles, to settle on his conclusion. Cryptologists previously thought the code was used to communicate secret messages, but Nordby thinks the pattern might have been instrumental in the teaching of rune instead. For instance, a means of memorizing the order of the alphabets. 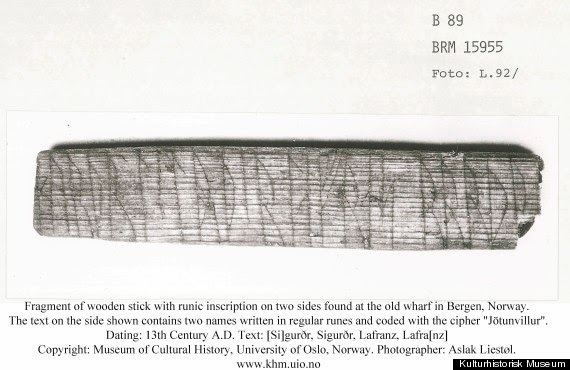 "We have little reason to believe that rune codes should hide sensitive messages," Nordby claims. "People often wrote short everyday messages." Amongst them -- "Kiss me," shown in coded rune in the first image above. Perhaps Nordby has stumbled upon a nearly millennium-old love letter? Dare we say, a Valentine? Whatever the case, runic code researchers deserve a round of applause. There's nothing like the glee felt after solving a good ol' medieval mystery. Aztec dog burials puzzle archaeologists. The secret story of the Venus of Willendorf.